Ah, the Euston Sandwich Bar, I've been meaning to visit for ages but was spurred into activity by a suggestion from visitor Steve Hill. It's on the North side of the Euston Road, near Great Portland Street tube. A tiny little place but always bustling and friendly. And always a welcoming glow in the Euston Road bleakness. The ebcb is faultless - look at the aesthetics, nicely reduced beans, those modern crunchy chips which really absorb the bean juice, and a beautiful pale egg. And the bacon is hugely flavourful - it tastes fresh off the pig. Simple condiment display. And isn't that the best sugar dispenser? I can't be doing with those spouty ones. They don't give you enough control. I didn't get great photos inside, I was stuck round the corner, but it's got great tables and counters and those magnificent orange plastic seats bolted to metal frames. You can't have customers moving themselves around when you've not got a lot of space. At lunchtime there are huge queues of people getting a sandwich to take back to their desk. But you can always find a seat, even if you have to sit next to someone else. Anne and I were sitting there yesterday, planning our future, sat next to a bloke chatting on his mobile earpiece thing about this gruesome operation he was about to have. The perfect cafe experience. Lovely tables. Lovely white crockery. They're open to 6.30. And everything's free. See the seats? That's how to run a well-ordered cafe. You've absolutely got my vote at the Yahoo! thing. I can't believe I never came across you before, so to speak. All I need now is a chippy blog and a hedgerow forager blog and I'll be set. Will link you post haste. Blimey! I used to here when i was a student! Thanks for the reminder! I will have to check it out again next time i am up that way. If you get chance there is a fantastic place in Battersea High Street that retains that faded 1960's glory..
At last a really useful website, thank you so much! Does amyone know of any fantastic greasy cafes in Enfield that I can visit on the weekends and in South East London while we're at it. Are you talking about C. Notarianni's in Battersea High St.,with the fantastic old-style ice-cream parlour exterior ? If so, this is basically an Italian pizza restaurant. One of the sons was a pupil at my old school in Battersea. This website would be a million times better if the cafes were sorted by geographic areas or you could search by county or city. I live in Leeds and I'm finding very hard to find my local cafs. I'm looking for a decent cafe in the centre of Newcastle-upon-Tyne. Any suggestions? Have you seen this site...? Euston Road Café - closing on June 24 2005!! When it's gone, it's gone! 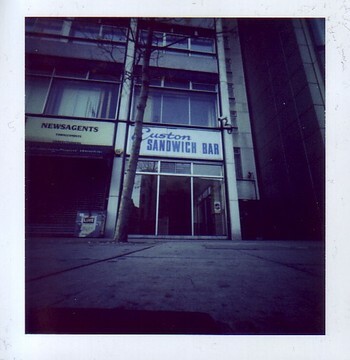 I was sent the link to ebcb by a mate, and quickly put in a plug for the Euston Road Sandwich Bar. Good News - I'm famous - the caff's on the site, and so is my name. Bad News - I was there last weds 26 January, and the lovely Polish lady said the building had been sold and that the Café was closing on 24th June. me and my best-friend mark went to the ESB last week and the good news is that the lease has been extended until Xmas 2005!!!! I walked past the ESB last Saturday morning. I know it's not open on Saturdays, but the interior had that definite look of still being open for business. Can any ESB regulars let us know if it's still in business ?